Beer Braised Lamb Shanks - What's In The Pan? 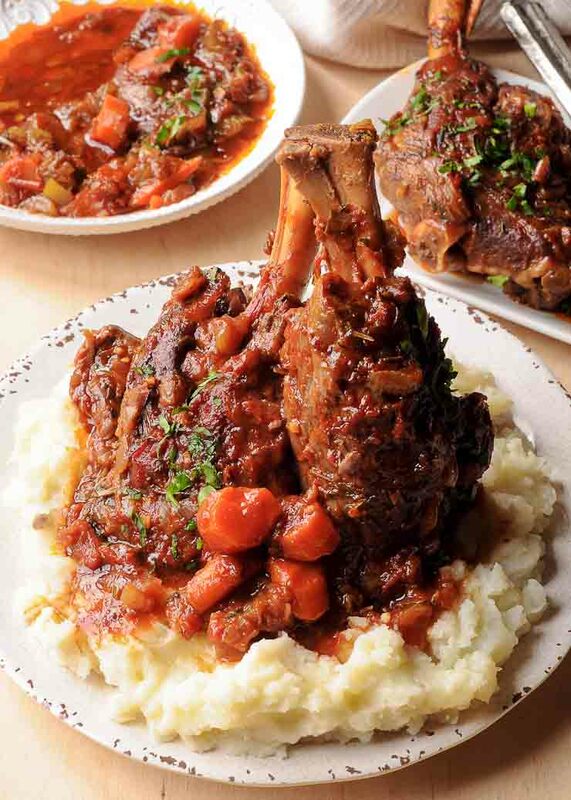 Braised lamb shanks is a dinner that has been around for ever but never gets old. 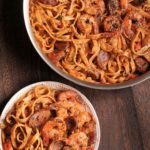 Everyone I know loves this classic dinner recipe full of tender lamb in a rich velvety tomato sauce. 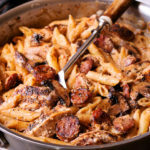 This comfort food is so perfect for the upcoming fall and winter months! The lamb is fork tender and flavorful! 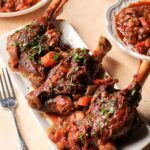 While I like to prepare roasted turkey breast instead of the whole turkey to grace the holiday table, I also can’t get enough of these melt in your mouth lamb shanks for Easter. Or, during any holiday season! I love the rich flavors from the dark beer, tomatoes and garlic! 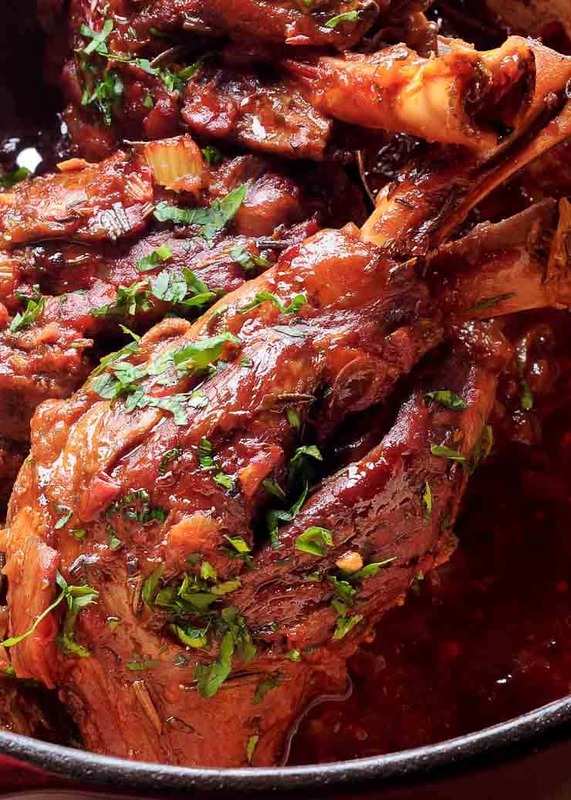 As well as the way they come together to flavor the best lamb shank recipe. So delicious! 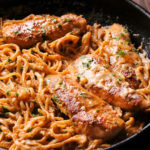 It’s great along with Instant Pot Mashed Potatoes, Irish Mashed Potatoes or Garlic Butter Pasta. I happen to love lamb because it’s so flavorful and delicious. Braising lamb makes it taste even better. There’s nothing better than having a restaurant quality food! Right on your table and made in your own kitchen! Now you can make a fancy meal that is easy to make and flavor packed in no time. If you haven’t made lamb shanks in your kitchen before, you should know that they are super simple. Here’s a few tips and tricks that will help you along the way! First things first, you will want to use a dutch oven with a lid for this simple lamb shank recipe. You will be using 3 to 4 lamb shanks. Secondly, you will want a 6 quart or larger dutch oven or enameled cast iron pan. If you have a 7 or 8 quart one, they will work well too. You may need to trim fat off your lamb shanks a little. I find that I like lamb to be less greasy. And the easiest way to accomplish lean lamb meat is easy. Simply trim a bit of fat from all the sides. The best braised lamb shanks will be cooked at 350F in the oven. Oven cooking provides even heat environment for perfect fall of the bone meat. Besides, it’s so much easier! Lastly, the cooking time is 2.5 hours. All the while the lamb shanks will be braised in the delicious beer mixture while your house will be filled with the most amazing aromas! 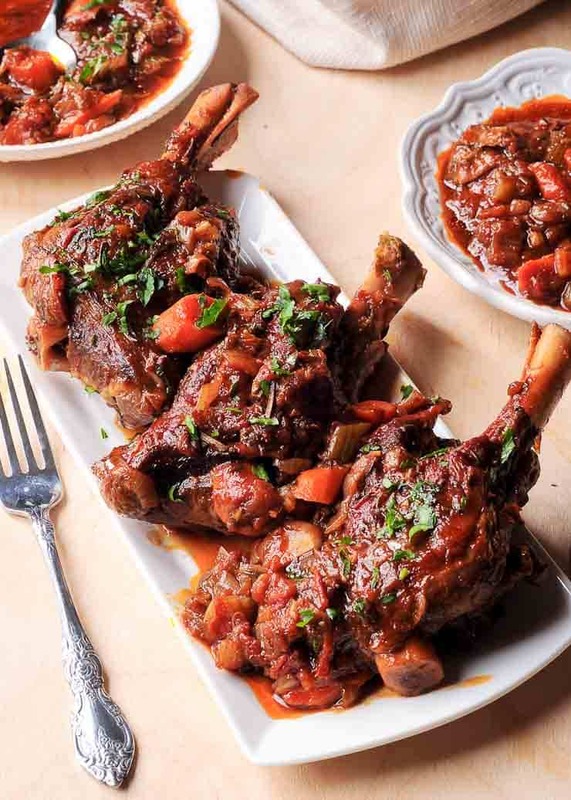 HOW DO I MAKE BRAISED LAMB SHANKS? You will want to start by browning the lamb shanks in the dutch oven. You can and should trim fat off the shanks. Then start browning them on medium high heat. Next, you will add in diced red onion, chopped rosemary, and garlic. Sauté until translucent. After sautéing onion and garlic, you will add carrots and celery. You will pour beer, crushed tomatoes, bay leaves, and beef stock into the dutch oven. Next place the lamb shanks into the dutch oven. Cover with a lid. Place the dutch oven inside the oven. Braise covered in the oven at 350F on for 2-3 hours until the meat is tender and beginning to fall off the bone. Substitute 1 additional cup of beef broth instead of beer. Or, you can add 3 to 4 tablespoons of vinegar. I suggest red wine vinegar, white vinegar, or apple cider vinegar. The reason why you might want to use vinegar here in addition to the broth is because the vinegar will help break down the protein structure in the lamb. And that is all to making the best braised Lamb Shanks! And what is your favorite comfort food for this time of the year? Perfect for the holiday table or special occasion! Season the lamb on all sides with salt and pepper. 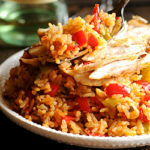 Heat a heavy-bottomed oven proof pan, such as a Dutch oven, over medium high heat. Add olive oil and then add the lamb shanks on medium heat. Sear carefully on all sides until they are golden brown. Remove the shanks and cover with foil to keep warm. Add onion, garlic and rosemary and sauté over medium-high heat for 5 minutes until they are translucent. Next add carrots and celery. Now add all the liquids: beer, beef stock, crushed tomatoes and bay leaves. Bring to a boiling point and then return the shanks to the pan. Cover the pan, move it covered to the oven and braise in the oven for 2 hours. Check to ensure lamb is tender - the meat should be beginning to fall off the bone. If not, cover and keep cooking. Ideal is when the meat is still holding onto bone. Pick out and discard bay leaves. Serve over mashed potatoes or pasta. We are making it this weekend!